Brocade VDX switches are designed to help organizations stay ahead of application-driven network change by enabling agile growth through a scale-out architecture. This approach offers three key benefits. First, it enables network expansion as a business grows over time. One can horizontally scale spine switches as the number of leaf switches increase. Second, scale-out architecture also enables the creation of resilient network fabrics, eliminating a single point of failure and potential downtime. Third, and most important, a scale-out network architecture delivers a compelling economic benefit. Unlike scale-up, a scale-out model lowers upfront investment. And by using high-density fixed switches, it lowers the Total Cost of Ownership (TCO), reducing power, cooling, and data center space. 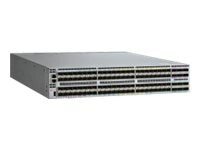 The Brocade VDX 6940-144S is a 10 GbE optimized switch with 40 GbE or 100 GbE uplinks in a 2U form factor. It offers 96 native 10 GbE SFP+ ports and 12 40 GbE QSFP+ ports, or 4 100 GbE QSFP28 ports. In addition, the Brocade VDX 6940-144S provides flexibility for uplinks, 40 GbE or 100 GbE from leaf switches, and delivers greater cross-sectional bandwidth for east-west traffic. Purpose-built for scale-out data centers and service providers, it enables aggregation of multiple server racks with a single switch. Brocade Network OS is pre-installed. (1) Internal power supply; support for 2 maximum.